Wooden bowls dyed with indigo leaves, hand-hammered brass spoons, chunky wool trivets made using millennia-old felting methods: With beautiful pieces like these in mind, F&W’s Test Kitchen created 12 outstanding summer recipes, from a sweet rye-crusted blueberry pie to a refreshing fennel, apple & avocado crudo. 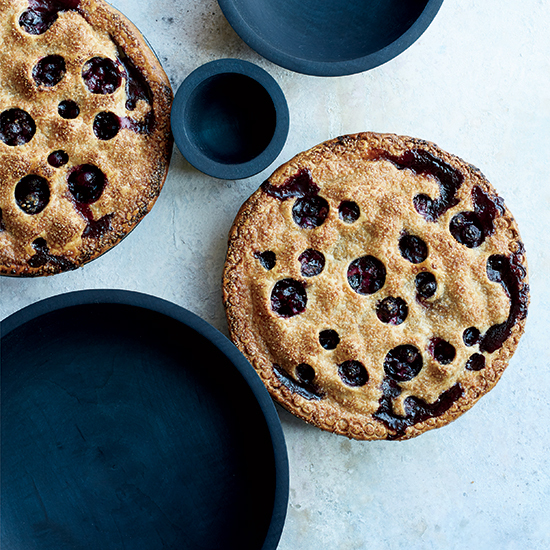 This sensational blueberry pie has small circles cut out of the rye crust, which not only looks dramatic but also allows moisture to evaporate from the fruit filling as it cooks, deepening the flavor. Roll out the top crust dough and cut it into strips of even width. Weave a lattice over the blueberry filling and seal at the edge. Blackberries, plums, sweet or tart cherries, apricots, apples and pears would all be delicious in this buttery rye crust. Roll out the rye dough and cut it into shapes. Press in chocolate chunks or chips and sprinkle with flaky sea salt, then bake. 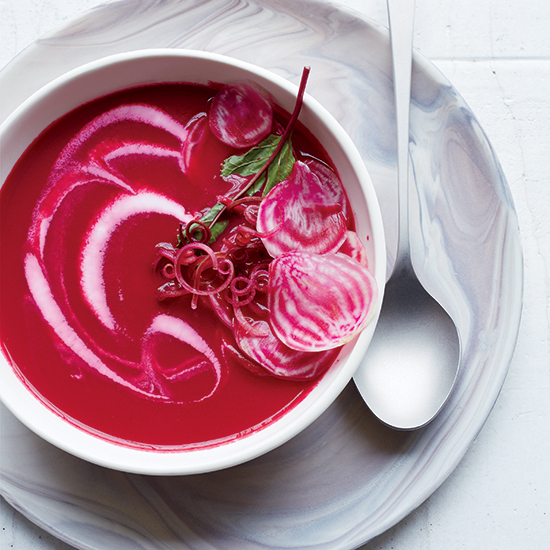 Shredding the beets and apples for this deep fuchsia soup cuts down on the cooking time and keeps the sweet-tart flavors fresh. 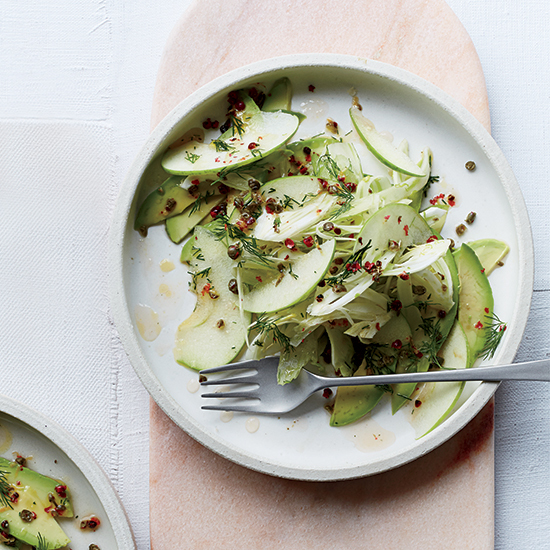 For a side salad, toss grated raw beets and apples with vinaigrette. Or mix them with horseradish and sour cream to have with roast beef. Instead of sour cream, use yogurt, buttermilk, coconut milk or tahini mixed with apple cider vinegar. Instead of the sliced Chioggia beets here, top the bisque with store-bought beet chips or sticks, or crispy rings of red or green apple. 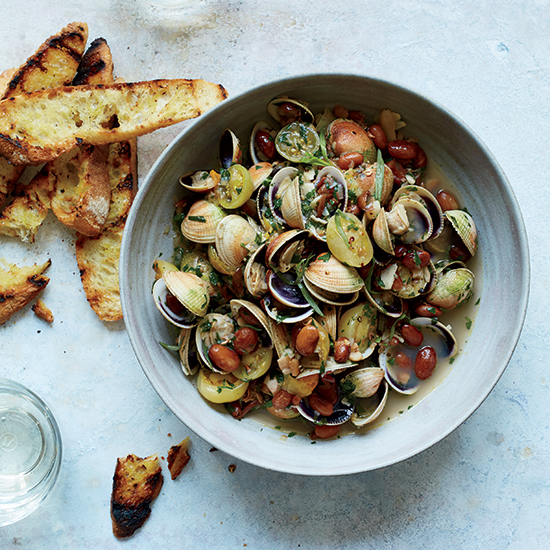 Cockles are some of the smallest bivalves, but they deliver an enormous amount of flavor. Just a few simple ingredients turn them into a rich, hearty stew. In place of cockles, which sometimes can be hard to find, use scrubbed and debearded mussels or littleneck clams. Finely shredded spinach, kale, Swiss chard, escarole or mustard greens would be delicious in this luscious stew. The broth here is superflavorful, so you could ladle the stew over hot spaghetti for a heartier meal. 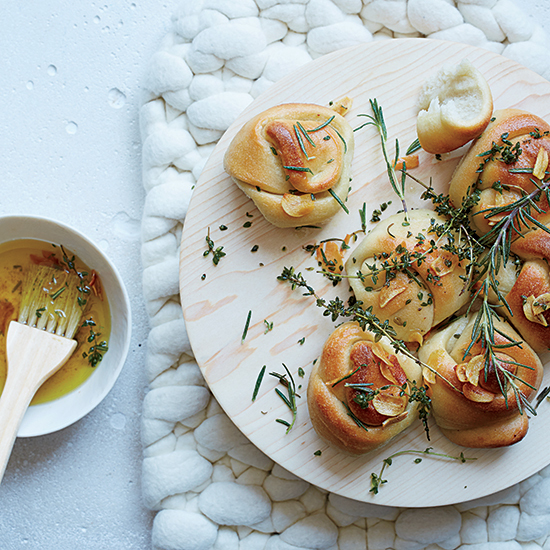 These tender pull-apart rolls are made from prepared pizza dough, which makes them easy to assemble. They’re brushed with garlic-infused butter as soon as they come out of the oven. Form the dough into rings or twists instead of knots and bake them on a sheet for a few minutes less. Dip balls of dough into melted butter and grated Parmesan or pecorino; sprinkle with more cheese before baking. Roll out the dough 1/4 inch thick and brush with the garlic oil. Sprinkle with the herbs and bake quickly until crisp. 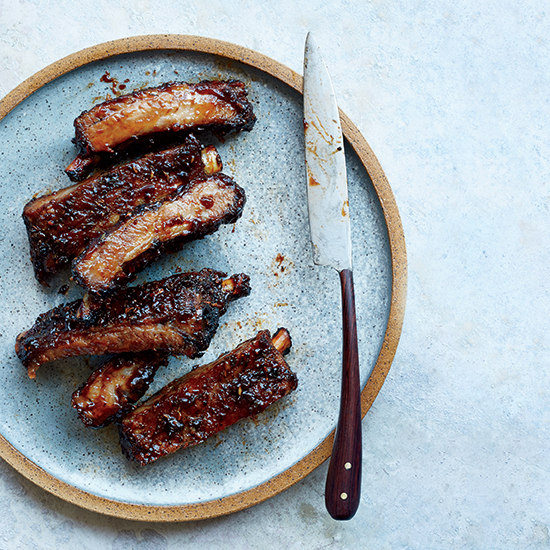 These tender, juicy ribs are seasoned with Tuscan flavors—garlic, fennel seeds and fresh herbs—and quickly glazed under the broiler with a sweet and tangy balsamic-laced barbecue sauce. It would also be great on other cuts of pork, as well as on beef, lamb, duck and chicken. Mix the balsamic sauce with mayo to spread on burgers or turkey sandwiches, or mix it into coleslaw. Brush the BBQ sauce on burgers, hot dogs, portobellos and sweet potato wedges on the grill for a sweet-tangy burnished sheen. 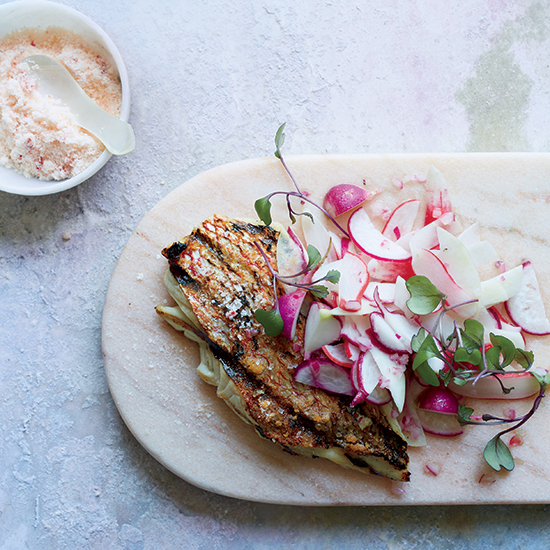 Once you make the pink chile salt that seasons both the fish and the salad here, you’ll want to have it on everything from raw and cooked summer vegetables to grilled bread, melons, mangoes and margaritas. Grill tomatoes until charred. Peel, then puree with olive oil and vinegar and season with the chile salt and pepper. Serve the snapper with lightly sautéed fava beans, English peas and snap peas with mint and grated lemon zest. Mix prepared mayonnaise with the chile salt (or minced red chile) plus minced fresh basil and fresh lemon juice. The dried fruits that traditionally dot this golden and aromatic Persian rice dish are replaced here with roasted multihued carrots. Toasted angel hair pasta adds fantastic texture. For a paella hack, fold in steamed mussels, sautéed shrimp and diced chorizo during the last five minutes of cooking. Top the cooked rice with sunny-side-up eggs, drizzle with harissa olive oil and serve with grilled lamb merguez. Add golden raisins and diced dried fruit. Fold in sautéed lamb or chicken and serve with yogurt and harissa. 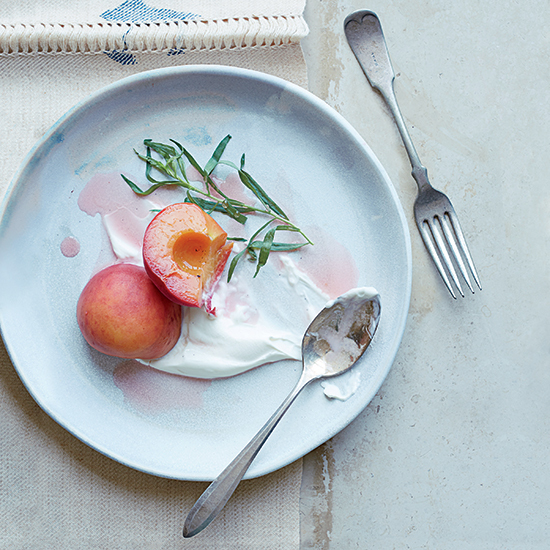 This five-ingredient dessert is an elegant way to serve peaches. Present the fruit halves skin-on or peel them while they’re still warm. For the rosiest color, look for peaches that have a lot of blush to the skin. Grill leftover poached peaches and serve with grilled chicken, pork or shrimp, or with fresh ricotta. Reduce extra syrup to drizzle over cake, melon or ice cream; mix with sparkling wine or water; or stir into fruit salad. Spoon leftover cream onto strawberries or grapes, or serve with beets, roasted carrots or baked potatoes. 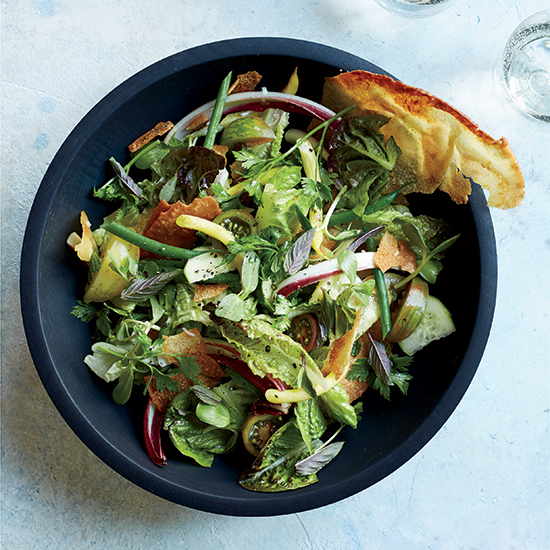 This baby romaine salad is amazing thanks to generous amounts of fresh green herbs, Kirby cucumber, green beans and oil-crisped pita shards. 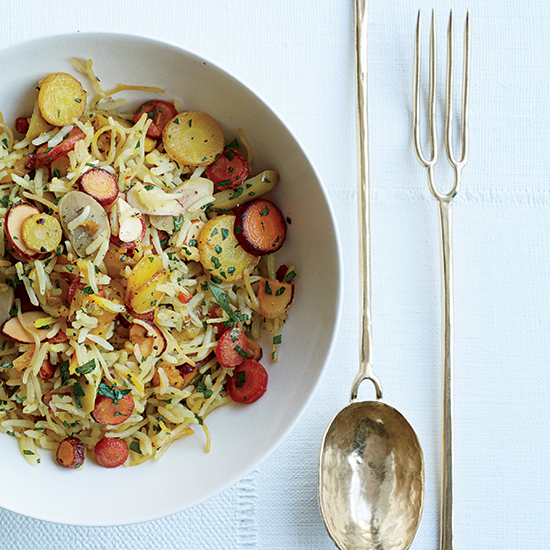 This recipe is a fantastic showcase for superfresh summer squash. 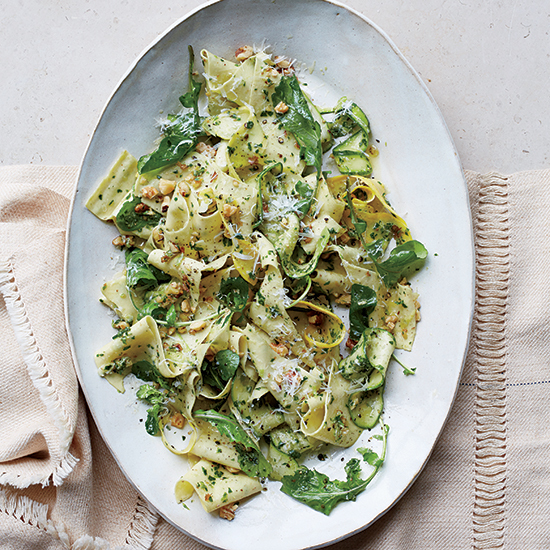 F&W’s Kay Chun cuts zucchini and yellow squash lengthwise into ribbons on a mandoline, then tosses them with hot pasta so they just barely cook. 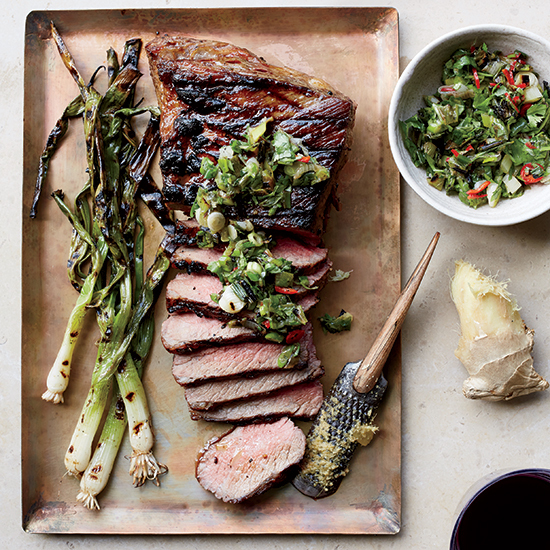 A bold relish made with spicy charred scallions and just-grated ginger transfoms an inexpensive but very flavorful steak.